Joseph Mallord William Turner was the most original genius in landscape painting of the nineteenth century. He was born in 1775 to a hairdresser of Covent Garden and his rudimentary elementary education was enhanced by his entrance to the schools of the Royal Academy in 1789. He studied perspective with Thomas Malton and in the house of Dr. Monroe, where he coloured prints, put in architect’s backgrounds and gave some lessons. His excursions into the countryside fuelled his inspiration for landscapes and his early water-colours and even pencil outlines were "faithful, firm and well drawn, full of truth and detail of every kind" (Samuel Redgrave). Having harnessed his genius for landscapes, Turner was drawn to the poetry of nature and his finest works resulted. By 1820 his style changed again, and he depicted light backgrounds full of the purest orange, blue, purple and other powerful colours. 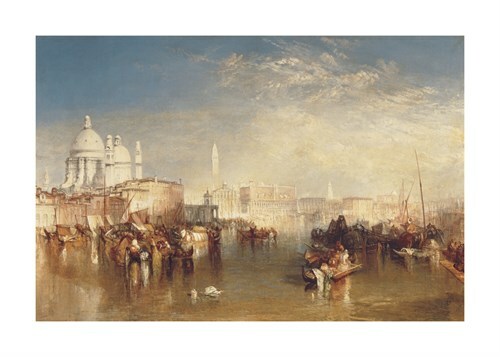 Turner was lucky in that his art was appreciated (and therefore a lucrative source of income) early in his career. On this basis, he was able to live comfortably in Harley Street, then in Hammersmith and then in a large house in Twickenham. His absolute genius was entirely contradicted by his shabby and ungainly appearance and manner. He never married, but did form a relationship under an assumed name with the woman in whose house he succumbed to his last illness. From there, after his death in 1851, he was transported to the crypt of St. Paul's, where he was buried. Turner made entioerly new advances in the expression of atmospheric space and luminosity through colour and in many ways he anticipated and inspired the Impressionists. He left a huge bequest of his work to the nation, some 300 paintings and 19,000 drawings and water-colours. These were at first divided between the Tate Gallery and the British Museum, but in 1987 the new Clore Gallery at the Tate was opened to house the bulk of the Turner bequest.